Urbanistically, the building acts as a “pivot point” between Tahititornin Vuori Park to the West, the South Harbor basin to the East, and the city with its Esplanadi Esplanadparken to the North. Each of the three urban linkages is expressed through a series of curved facades which are able to define generous urban plazas within the tight footprint of the site. An interior circulation system - the lobby canyon - connects park, harbor, and city. The lobby canyon is the circulatory “promenade” of the Guggenheim Helsinki. It is the place to meet or enjoy a cafe - immersed in art and Nordic architecture. The flat horizontal elevation of the museum is a reference to the existing warehouse typology along the South Harbor waterfront. The characteristic catenary shape of the roof and facade elevations emphasizes the public and programmatically distinguished character of the museum. From an urban point of view, the massing is simple, yet distinctive. Programmatically, the building is characterized by three main functional zones. The northwest volume houses program and event spaces as well as museum administration, the northeast volume contains the museum store and restaurant, and the larger southern volume contains all gallery exhibition spaces and supportive functional spaces. 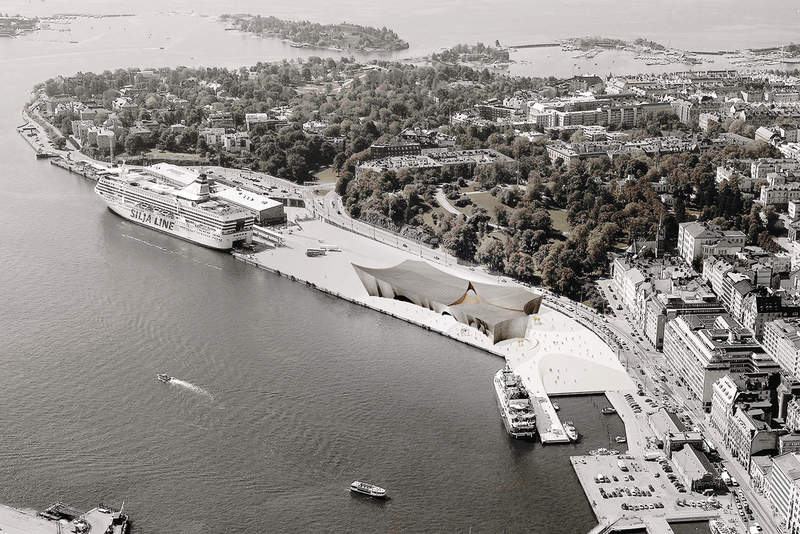 The Guggenheim Helsinki is designed to maximize public interaction. The lobby canyon is a true public space and can be entered from three sides without buying a ticket. The museum store, cafeteria and restaurant, the center project space, as well as the auditorium become part of Helsinki’s public (and free) urban infrastructure. The galleries can be visited after purchasing a ticked and entering the visitor screening and bag check area. The interior of the galleries is functional and flexible, with architectural emphasis placed on key moments such as the double height galleries, balcony views into the canyon, or view to the park and harbor. The texture and color of the exterior facade of the museum is strongly influenced by Helsinki’s identity and heritage as a Nordic neoclassical city. The light concrete color of the Guggenheim’ facade harmonizes with its urban context. The undulation of the facade modules gives the massing a light and weightless character. The interior lobby canyon is cladded in wood, giving this grand civic space a warm and welcoming atmosphere. The Guggenheim Helsinki embodies the delicate craft and subtlety of Nordic furniture design into its architecture and choice of materials. Helsinki is a city of subtle, yet powerful experiences. The elements (light, wind, darkness, the seasons, the sunset, the cold, the warmth of the sun, the sound when walking on snow on a cold night) are more present in Helsinki than in other Guggenheim locations. We aim to build a building which embodies these subtleties of Helsinki into a piece of architecture. A building which does not aim to be memorable because it defines itself as iconic, heroic, or spectacular but is characterized as simple, quiet, and experiential.